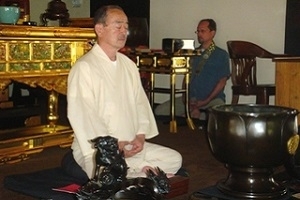 Zen Shin meditation is a unique Buddhist practice established by Rev. Koshin Ogui (pictured here), a former resident minister at MBT and also former bishop of the Buddhist Churches of America. The story is that when he was serving the Cleveland Buddhist Temple, Rev. Ogui received many phone inquiries from community members wanting to come to the temple for meditation. But because meditation is not a usual practice in Shin Buddhist temples, Rev. Ogui repeatedly had to turn them away. After a while, he got the idea to start something so that all those interested in meditation would come to the Cleveland Buddhist Temple. Although Rev. Ogui was a Shin Buddhist minister, he had had experience with Zen Buddhism growing up in Japan and again later in life in San Francisco with Shunryu Suzuki, founder of the San Francisco Zen center. What he started, Zen Shin, combines Shin Buddhism’s awareness of Oneness with the discipline of Zen practices. Zen Shin, which Rev. Ogui brought to MBT, combines sitting and walking meditation, chanting and the offering of a Dharma talk. The meditation sessions are held in the hondo (temple hall), which is a very peaceful and harmonious space. Participants can either sit on cushions on the floor or on one of the benches. Neither one is “right.” What is right is that the individual feels physically comfortable while keeping a healthy posture. Full instructions are given throughout each session. The atmosphere is relaxed and friendly. Every effort is made to help newcomers feel comfortable and at ease. Basically, the sessions are structured with 15 minutes of sitting meditation and walking meditation, another 15 minutes of sitting meditation, chanting, incense offering and a short Dharma talk. Zen Shin meditation at the Midwest Buddhist Temple provides an accessible and meaningful way to learn and practice meditation for those new to meditation and those who come from other religious backgrounds and faiths. Zen Shin meditation sessions are held twice a week: 6:00 to 7:00 pm Wednesdays and 8:30 to 9:30 am Sundays all year (please check the calendar on our homepage). Many find the Wednesday Zen Shin sessions a convenient midweek refresher after work or the Sunday morning sessions a peaceful way to start the week.